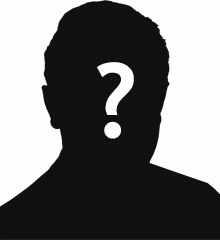 Robert James Williams was the son of Mary Williams. He was born in Dundalk, County Louth. Robert lived in Dublin. Robert Williams enlisted in Cookstown. Sergeant Robert James Williams was serving with the 7th Battalion of the Royal Inniskilling Fusiliers when he was killed in action during the Third Battle of Ypres at Passchendaele on Thursday 16th August 1917. Dochy Farm New British Cemetery is located 7 kilometres north-east of Ieper town centre on the Zonnebekestraat, a road leading from the Zonnebeekseweg (N332) connecting Ieper to Zonnebeke. Two roads connect Ieper town centre onto the Zonnebeekseweg. The Torhoutstraat leads from the market square onto a small roundabout. Take the first right turn which is Basculestraat. At the end of Basculestraat there is a crossroads and Zonnebeekseweg is the turning to the left. 7 kilometres along the Zonnebeekseweg, in the village of Zonnebeke, lies the left hand turning onto the Langemarkstraat (further on this street name changes to Zonnebekestraat). The cemetery lies 1.5 kilometres along this road on the left hand side. 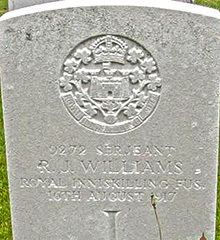 5 War Graves Photographic Project Photo of Sergeant Robert Williams' grave can be purchased here.